After years of 9-5 work days and being pressed for time to do the activities you enjoy, retirement is finally here. While we welcome the years with open arms, it can be a difficult challenge for many to find a purpose and enjoy the new found spare time. We all have retirement plans and “what if scenarios” that would be possible if money were no object. However, the truth of the matter is that it is important to live within your means to help spread your savings through retirement. 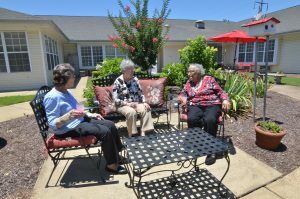 When making retirement plans it is important to factor in the cost of moving to a retirement community that can provide long term care. The cost can be covered through a combination of savings, Medicaid, home equity, veteran’s benefits, a reverse mortgage or long term care insurance. To help determine how long your savings and retirement income will last, use the US News retirement readiness calculator at http://money.usnews.com/money/personal-finance/features/calculator. No matter your budget, there are a variety of ways you can add fun and purpose to your golden years. From churches to charities there are countless opportunities to volunteer. It can be very rewarding to give back to your community. After years spent working it can feel a little odd to have so much free time. If you are able, a part time job can help with insurance benefits and keep you financially independent. There are many companies that would love to have extra help and a smiling face. Retirement can be an ideal time to tackle remodeling projects. Home renovations can increase the value of your home. If you are planning to downsize, remodeling can ensure you get the best possible price for your home. For those well admired and connected in the city, public service may be an ideal activity. You can write letters to your city council members or state representatives, hold office in civic organizations or even run for elected office. Did you have dreams of sewing or learning a second language? Retirement is the perfect time to learn new skills or develop a new hobby. Whether it’s cooking or sewing, there are countless activities waiting. Traveling the world is a dream for many retirees. With retirement comes a limited income, so traveling to foreign lands may be out of the question. While you might not be able to play tackle football or join in a game of hoops, there are a variety of activities that can keep you active. From bridge games to walks around the local mall, there are countless ways to stay moving. No one said you have to be a great artist to enjoy the arts. Pick up your paintbrush or shovel and rediscover the creative outlets that you once enjoyed. Express your creativity and enjoy the fruits of your labor. If you haven’t had the time to enjoy a good book in years, now is the perfect opportunity to pick up a page turner. If you would rather watch the classics as oppose to reading them, streaming services like Netflix can provide thousands of choices for a nominal monthly fee. There is no need to spend a fortune to be entertained. Senior adults are a wealth of knowledge when it comes to stories and experiences. Don’t waste your knowledge, share it with the younger generations. From writing a blog to mentoring adolescents, there are a variety of ways you can teach others and share your knowledge. From volunteering to teaching and traveling to creating, there are countless activities that will help you find purpose and enjoyment during retirement.